This is my shout-out to Andy Sperandeo, for contributing one of the most ground-breaking – if under-appreciated – layout designs ever published in a major hobby magazine. Of course, I’m referring to the ATSF San Jacinto District – an HO scale walk-in, walk-around layout featured in the February 1980 issue of Model Railroader. It would be relatively straight-forward to resize this layout for 1:64, adding broader curves and longer switches if possible. – The original article does a great job of describing operation, etc., so I won’t duplicate that. Buy a copy of the issue from Kalmbach. Find it in the Model Railroader DVD. Or find it in one of Kalmbach’s layout planning special issues – it’s been featured a few times. 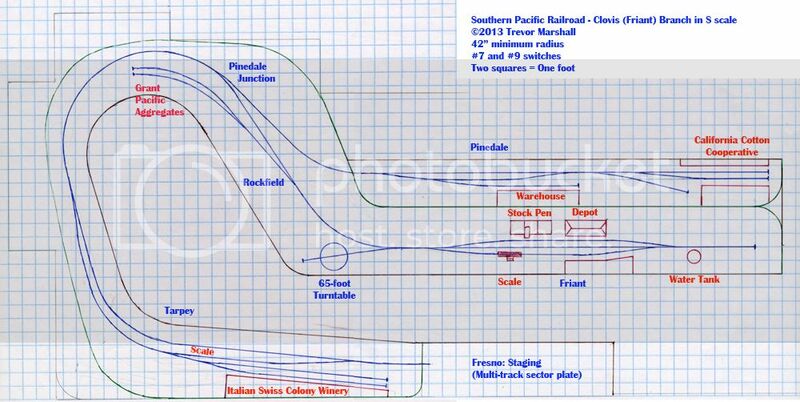 – Instead of a traditional three-track stub-end staging yard, I’ve drawn a sector plate – similar to what I have on my own layout. While I’ve given it three tracks, I would suggest building the benchwork and then figure out how many tracks you can squeeze onto the shelf. As with Andy’s original design, this could be hidden behind sliding doors – or a curtain. – If one had more than the 14-foot width I used for this plan, I would cut the main between Perris and the switch to the Hemet Industrial Area, and lengthen the mainline here to widen the aisle at Perris. 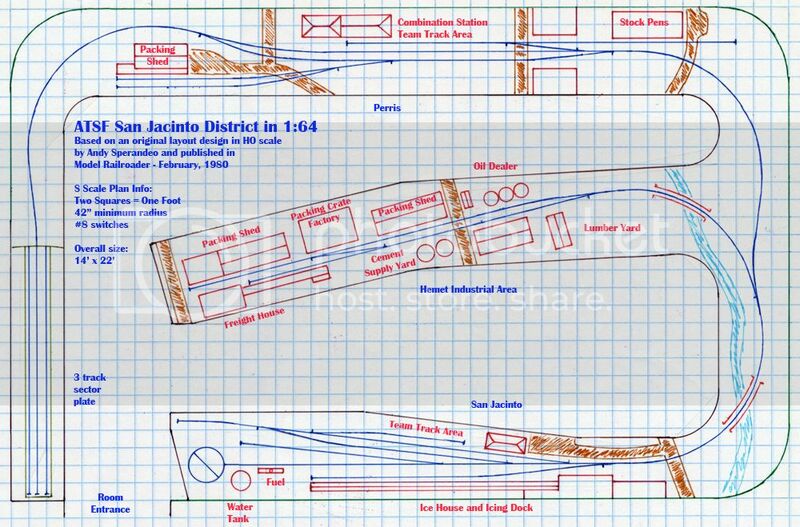 At the left side of the plan, one could replace the sector plate with a conventional yard, feeding all the tracks onto a 12-inch (65-foot) turntable at the far end of the shelf. This would accommodate small steam or diesels, and reduce handling of the equipment. – Regardless of the style of staging area one uses, some extra shelves on the wall above the staging area could absorb a tremendous amount of equipment. – I’ve made no attempt to accurately draw the structures – just suggest their locations. I did move the water tank in San Jacinto, putting it closer to the turntable from its original location near the station. – Certainly, this layout doesn’t have to be the San J district. For example, one could easily substitute Southern Pacific standard stations, freight houses, water tanks and other facilities for the ATSF designs. 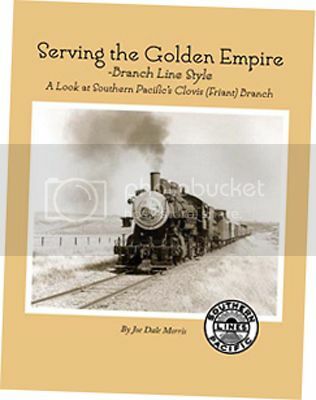 It would then be an ideal plan on which to set loose a couple of the S scale Southern Pacific 2-6-0s recently announced by Dan Navarre at River Raisin Models. Andy – In 1980, this plan was decades ahead of its time. It still works, really well, more than 30 years later. And it did more to influence how I think about layout design today than just about anything else I can recall. Thank you! UPDATE: I learned yesterday (October 3, 2015) that Andy has passed on. I knew he had a number of health issues but it still came as a shock. His time at the helm of Model Railroader is, for me, a high point in the publication’s history. I had the opportunity to see him a few times over the years – notably, we shared duties in the yard on John Armstrong’s layout at an operating session in 2002. His knowledge of the hobby was extensive, and he was always willing to share it. Most of all, he was a fun person to hang around with. Relationships are the most important part of this hobby – more important than the stuff. He’ll be missed by many – including me. I have a number of books about the CPR electric lines in Southern Ontario. These include Steel Wheels Along The Grand by George Roth, which features a number of photos of these lines after the wire came down and CP Rail converted the operation to diesels. This book also includes rough track maps of various locations. Based on these, I’m interested in doing a post in my achievable layout series about the spur that ran along Caroline Street in Waterloo, to serve the Seagram Distillery and Carling/Labatt’s brewery, plus furniture factories and other manufacturers. 1 – I’d like a few photos of the Caroline Street operation, in the era worked by CP Rail’s SW1200RS locomotives. I’ll add a “Copyright” line to the picture and give you a shout-out if I use your pictures. Let me know if you have anything. 2 – George’s book is a big help and a great start, but even after comparing his map to a Google satellite view of the area, I still have questions about exactly where some of the spurs went. If anybody can help me nail down the track arrangement for this area, I’d love to hear from you. Since I’m asking about CP Rail, a friend in California emailed to ask about sources for information about the CPR in Goderich, Ontario. If anybody has suitable sources for information – track arrangements, photographs, good books, and so on – please get in touch. Thanks for your indulgence. I now return you to the CNR in Port Rowan. I recently offered to doodle some plans for a friend of mine who recently moved and wants to build an S scale CNR layout. He’s fairly open to ideas and I thought it would be interesting to explore the possibilities in his new layout space. I came up with four designs – all heavily influenced by the prototype – but the one I liked the best is a layout depicting two towns on the CNR’s Southampton Sub. 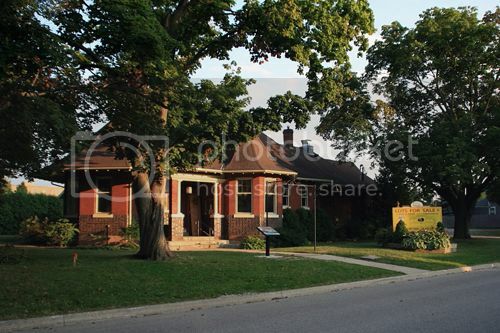 This subdivision was served out of Palmerston, Ontario and is written up in Steam Over Palmerston by Ian Wilson. Southampton was an obvious choice for inclusion on the layout plan. The town featured: a handsome brick station; a freight shed; a two-track engine house; a section house with adjacent oil storage shed; a company (WH Rogers) that received lumber and other building supplies plus fuel oil and coal; and two furniture factories (Fitton Parker Furniture Ltd and Hepworth Furniture Co), each with their own spurs. These factories received lumber by rail, and shipped carloads of furniture. They also received other materials in Less-than-Car-Load (LCL) shipments via the freight shed. So, in addition to all the normal activity in a terminal, there are interesting railway customers that would generate a variety of traffic. 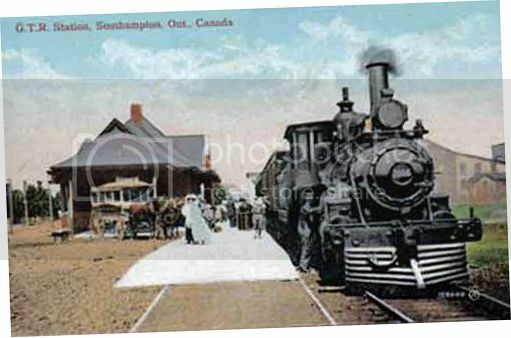 Notably, the Southampton terminal had no run-around track. Instead, a wye adjacent to the yard was used to turn trains and steam locomotives. M329 would arrive in Southampton and – if it was short enough – would proceed directly to the station. After unloading passengers, the entire train would turn on the wye, then the crew would proceed to do its switching. (Longer trains negotiated the wye before making the station stop, so that the passenger cars could be spotted at the platform for unloading.) With the switching done, the passenger cars would be placed on the track next to the engine house – the lead to the two furniture factories – and the engine would tie up in the house. Train 179 would arrive at the station, unload people and express, turn on the wye, then spot the passenger cars on the lead to the freight house before retiring to the engine house for the night. While many of the online towns are worth including on a layout, I chose Mildmay (MP 15.14) for several reasons. On the prototype, Mildmay was laid out on an S curve and – as shown in several photos in Ian’s book – the terrain has a nice roll to it here. Mildmay also has a good variety of customers – and, for the most part, different than those at Southampton. There’s a combination depot, a stock pen, a coal shed, and a co-op. The Schwalm Sawmill has a spur with stacks of lumber piled high beside it. Schwalm also stacks lumber along the spur beside the stock pen, and Ian’s book suggests the company receives building supplies such as cement and wallboard as well. Across from the stock pens, the JA Goetz turnip waxing and storage building makes for an interesting railway customer – one that’s not often modelled. Ian’s book notes that many of the turnips were exported to the United States, in American refrigerator cars (eg: PFE and FGE). Such cars would add a welcome spot of colour to a train. A bridge over the Teeswater River north of Paisley limited the branch to 4-6-0 and 2-6-0 locomotives. Until September of 1956, each train on the line ran with a baggage-mail car and a coach. The mixed might have a boxcar in express service, too – plus regular freight cars from and for online customers. After the mail contract was cancelled, the RPO was replaced with a full baggage car. My friend has a space approximately 13.5 feet by 20.5 feet, with a 5.5 by 7.0 foot alcove in one corner, and permission to build over the laundry area (a soft boundary) in the diagonally opposite corner. For this plan, I used 42″ minimum radius on the main, but a 36″ radius on the lead to the engine house, and the spur to Fitton Parker in Southampton. I specified #9 switches anywhere that a passenger car might travel, and #7 switches elsewhere. The tail track of the wye curls into the alcove and there’s about 8 feet of tail beyond the switch, so that’ll govern train length. Eight feet is pretty good for a branchline train in S, though – with 3.5 feet taken up by a locomotive and two passenger cars, the remaining 4.5 feet still allows room for a half-dozen 40-foot freight cars. I made sure that the backing move in the alcove would be through the straight side of the switch, which will reduce the likelihood of derailments. Equipment needs are modest, which is always a good thing in S. The layout would require two small steam locomotives (a combination of 2-6-0s and 4-6-0s), two baggage-mail or full baggage cars, two coaches and an assortment of freight cars – boxcars, tank cars, stock cars, hopper cars, and so on. The locomotives have been done as brass kits (and are what I use on my own layout). My baggage-mail conversion would work well, as would the MLW Services Colonist Car. We don’t yet have a CNR full baggage car in S, unfortunately – so I guess the mail contract is still valid! Prototype layouts are always a compromise and the big one here is that I have drawn Southampton as a mirror image. It was the only way to fit this interesting terminal into the room. The good news is, creating a mirror image of a terminal doesn’t change how it operated one bit. I put Southampton on a peninsula so it could be viewed (and worked on) from both sides. The access aisle along the top of the diagram is narrow – just 24″ wide – but that’s plenty for an operator to step sideways along the scene. The wall here could be painted sky blue, or even given a full backdrop treatment. It would look great when photographing the town from the centre of the space. The furniture factories will be lovely imposing brick structures – and look big enough to justify carload traffic. The engine house will be right up front, where visitors can enjoy a fully-detailed interior. At Mildmay, the scene gets fairly deep – the road on the plan is 39″ long. For access, I would notch the benchwork under the turnip plant and build the structure on its own, removable base. Lift it out of the way, put it somewhere safe (top of the dryer in the laundry, perhaps?) and then one could step into the scene to maintain track or scenery near the backdrop. Some shrubs along the join line would conceal the lift-away nature of the plant, and trunk latches could keep it securely in place. While not shown on the plan, I’ve indicated room for the mill pond at Mildmay (wrong side of the tracks, but that’s okay). I’ve also indicated a suitable spot for a bridge scene. While the weight-restricted bridge north of Paisley was straight, something similar could be built on the curve – and the 5 mph slow order on this bridge would help extend the run. 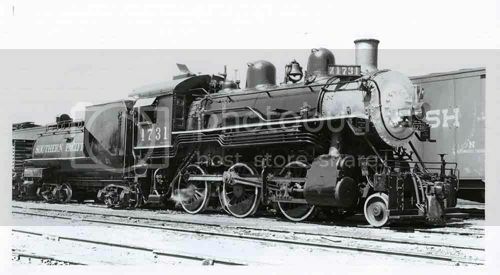 Train M329 would consist of a 10-wheeler or Mogul, a few freight cars for Mildmay and Southampton, a boxcar in LCL service, a head-end passenger car, and a coach. It would start in staging – a stub-end yard over the laundry – and run to Mildmay. There the crew would do their station stop, then set off freight cars. This would require run-around moves since the train overnights in Southampton (leaving the cars within sight of the co-op or sawmill would likely result in strong words from those customers). Arriving at Southampton, the crew of M329 would wye the train, do its station stop, and leave the passenger cars at the platform while freight cars were spotted as needed – including spotting the LCL car at the freight shed. The passenger cars would be moved to the industry lead next to the engine house, and the crew would tie up. Train 179 would consist of a 10-wheeler or Mogul, a head-end passenger car, and a coach. It would start in staging, make stop at Mildmay, then run straight to the station at Southampton. After doing its unloading, the crew would wye the train, spot the passenger cars on the freight shed track, and tie up in the engine house. 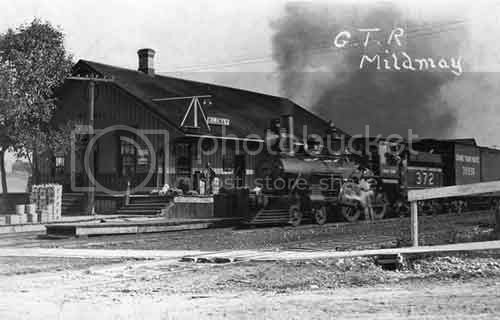 Early the next morning, a crew would board an engine at the house, collect the passenger equipment for Train 178 and back it to the station. The crew would leave for Palmerston, making a station stop en route at Mildmay. With 178 out of the way, the crew for M330 could go on duty. The passenger cars would be spotted at the station, then the crew would collect any freight cars ready to leave town – including the LCL car, which would have to be placed next to the passenger equipment. M330 would leave town, make a station stop at Mildmay, lift any freight cars from Mildmay, then head to Palmerston. It’s difficult to incorporate a wye into a layout in any scale – but especially in a larger scale such as S. So I’m pleased with how this plan turned out. I hope it offers some ideas to others faced with an awkward prototype like Southampton.